ATLANTA, Aug. 31, 2018 /PRNewswire/ -- Georgia Power announced today the latest milestone at the Vogtle nuclear expansion near Waynesboro, Georgia – the placement of the third of four steam generators. The 1.4 million-pound steam generator was recently lifted into the Unit 4 nuclear island and marks a significant accomplishment for the nation's only new nuclear units under construction. Steam generators, measuring nearly 80 feet long, are heat exchangers used to convert water into steam using the heat produced in a nuclear reactor core. The steam generators for the new units were fabricated in South Korea and transported to the site via the Port of Savannah and then via rail. The final steam generator for the project is onsite and expected to be placed in the coming months. Watch a time-lapse video of the placement here. 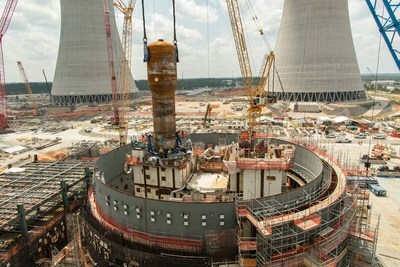 Other milestones at the Vogtle site over the past two weeks include the installation of the fourth and final cooling water system pump for Unit 3. Each pump, weighing 62,000 pounds each, will circulate 160,000 gallons of water per minute, taking the cool water from the cooling tower basin and circulating it through the condensers in the turbine building to help cool the steam coming off the turbines. The warm water is then recirculated through the natural-draft cooling towers, where the heat is released to the atmosphere. Georgia Power provides a full report every six months on the Vogtle nuclear expansion to the Georgia Public Service Commission (PSC) through the detailed, transparent Vogtle Construction Monitoring (VCM) process. The 19th VCM Report, available here, outlines recent progress made at the site, as well as the latest information on cost and schedule for the project. Certain information contained in this communication and the 19th VCM Report is forward-looking information based on current expectations and plans that involve risks and uncertainties. Forward-looking information includes, among other things, statements concerning the expected cost and schedule for completion of construction of Plant Vogtle Units 3 and 4. Georgia Power cautions that there are certain factors that could cause actual results to differ materially from the forward-looking information that has been provided. The reader is cautioned not to put undue reliance on this forward-looking information, which is not a guarantee of future performance and is subject to a number of uncertainties and other factors, many of which are outside the control of Georgia Power; accordingly, there can be no assurance that such suggested results will be realized. The following factors, in addition to those discussed in Georgia Power's Quarterly Report on Form 10-Q for the quarter ended March 31, 2018, and subsequent securities filings, could cause actual results to differ materially from management expectations as suggested by such forward-looking information: the impact of any failure to amend the DOE loan guarantee to allow for additional borrowings; state and federal rate regulations and the impact of pending and future rate cases and negotiations; the impact of recent and future federal and state regulatory changes, as well as changes in application of existing laws and regulations; the uncertainty surrounding the recently enacted federal tax reform legislation, including implementing regulations and Internal Revenue Service interpretations, actions that may be taken in response by regulatory authorities, and its impact, if any, on the credit ratings of Georgia Power; current and future litigation or regulatory investigations, proceedings, or inquiries; available sources and costs of fuels; effects of inflation; the ability to control costs and avoid cost and schedule overruns during the development construction and operation of facilities, including Plant Vogtle Units 3 and 4 which include components based on new technology that is just beginning initial operation in the global nuclear industry at scale, including changes in labor costs, availability and productivity, challenges with management of contractors, subcontractors or vendors, adverse weather conditions, shortages, increased costs or inconsistent quality of equipment, materials, and labor, including any changes related to imposition of import tariffs, contractor or supplier delay, non-performance under construction, operating, or other agreements, operational readiness, including specialized operator training and required site safety programs, unforeseen engineering or design problems, start-up activities (including major equipment failure and system integration), and/or operational performance; the ability to construct facilities in accordance with the requirements of permits and licenses (including satisfaction of U.S. Nuclear Regulatory Commission (NRC) requirements, to satisfy any environmental performance standards and the requirements of tax credits and other incentives, and to integrate facilities into the Southern Company system upon completion of construction; advances in technology; legal proceedings and regulatory approvals and actions related to Plant Vogtle Units 3 and 4, including Georgia PSC approvals and NRC actions; a decision by more than 10% of the owners of Plant Vogtle Units 3 and 4 not to proceed with construction; the inherent risks involved in operating and constructing nuclear generating facilities, including environmental, health, regulatory, natural disaster, terrorism, and financial risks; interest rate fluctuations and financial market conditions and the results of financing efforts; changes in The Southern Company's or Georgia Power's credit ratings, including impacts on interest rates, access to capital markets, and collateral requirements; the impacts of any sovereign financial issues, including impacts on interest rates, access to capital markets, impacts on foreign currency exchange rates, counterparty performance, and the economy in general, as well as potential impacts on the benefits of U.S. Department of Energy loan guarantees; and the effect of accounting pronouncements issued periodically by standard setting bodies. Georgia Power expressly disclaims any obligation to update any forward-looking information.